Selecting the right kind of jewellery for your wedding dress is very essential. The jewellery is not just an accessory but it is also the focal point of the entire wedding dress. Depending on the neckline of your wedding gown, it is essential to choose the right kind of jewellery that blends in well and enhances your look. Here are a few suggestions on how to choose jewellery based on different necklines. The sweetheart necklines have a very delicate and feminine look. Considering the personality and characteristics of each neckline, the jewellery that you choose should reflect the same. Delicate looking necklace of white gold and diamonds will complement this neckline perfectly. If you choose to have yellow gold, make sure that it does not overpower the neck. A light yellow gold necklace is a good take. When you have a square shaped neckline, you can choose jewellery that is not very heavy but not light either. The medium sized look with a delicate design also allows you to choose a heavy but small or light and long looking necklace. Medium sized earrings will blend in perfectly with this neckline. You can go all bold with heavy neck sets and multi- lined designs. This neckline gives you the flexibility of choosing big sized jewellery. You can comfortably chariot without feeling guilty of going overboard. Since this neckline leaves your shoulders and arms exposed, you have to turn the attention of eyes to your neck through your jewelry. If your wedding gown has a rectangular shaped neckline, choose small earrings and a nice big and heavy necklace. This is because you can emphasis on your neck area perfectly with a heavy necklace. Smaller earrings are advisable since they will not overpower the embroidery done on your neckline. If you do have a bare neckline, wedding gown (for example, the use of net or lace) you can opt for a medium sized earring. For accessorizing this kind of neckline, the emphasis should be more on bigger earrings and small necklace. This is because there are variations of this neckline which only the fit in the neck region. Since it is a sleeveless look, emphasize on the earrings and not on your necklace. The scoop or pot neck is another broad looking neckline where you can emphasis more on your neck. Big and broad neck sets with medium sized earrings is one way to accessorize the neck. You also have the liberty of choosing the choker styled neckpiece. If you are going for a staples wedding gown, you can accessorize your neck with a nice choker. You can also wear vintage jewellery to highlight the beauty of the dress. Any design that you choose has to be delicate and feminine looking. Bulky jewellery is a not advisable but if you can carry it well, you can surely go for it. Long delicate earrings and a feminine looking to reset is the best way to accessorize this kind of neck. Emphasis of this neckline lies on one side of your shoulder. When choosing the necklace, look out for the ones that have motif in the side and not the center. This motif will highlight the bare space of your sleeveless hands beautifully. Delicate, single layered or V-designed neckpieces are perfect for this kind of neck. For the years, you can opt for any size and it will blend in perfectly. While accessorizing your wedding gown, make sure that you choose motifs that are not very big but speak out loudly. Nothing brings sophistication and absoluteness onto one’s bridal silhouette quite like wedding jewelries. However, pairing too much jewelry with your already glamorous wedding gown inadvertently shift away all the attention from your wedding dress, and might also leave you with an overtly fussy appearance. For exuding real elegant vibe off your bridal look, the golden rule of “not wearing too many glitzy pieces” must be followed. Moreover, depending on the type of wedding you are planning, for example, formal or beach, the dressing should be done accordingly. For, what may look elegant on an indoor theme might not look equally elegant on a beach side wedding party! With plethora of options in wedding jewelries, many couples find it excruciating to single out their perfect choice. Therefore, to ensure that you don’t blow away your gorgeous wedding look by over-accessorizing, here’s are some helpful tips beforehand. Read on to know more. Unless you don’t want to take away envious eyes off of your wedding dress, don’t overdo accessories. Your statement wedding necklace must be complementary of whatever you are wearing, and should not be something that is recklessly lying on another tangent. 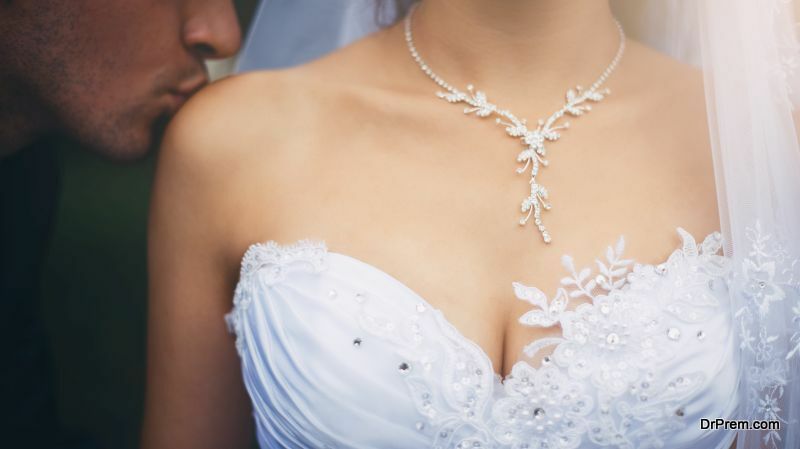 Wear jewelries according to the necklines of your wedding gown. 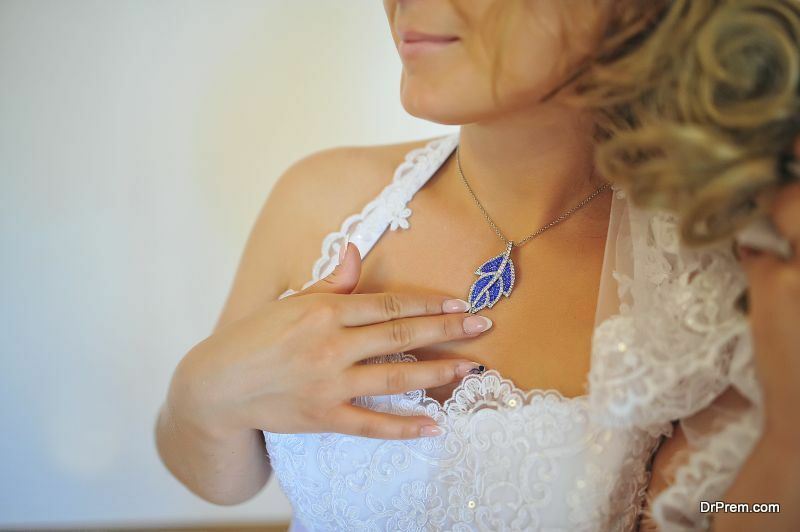 The reflection of embellishment should also come from your wedding necklaces. If you are wearing a gown featuring a beaded neckline, for instance, be sure that it complements with the style of your neck and shoulder. Likewise, over-embellished necklaces can create an impression of shorter neck and fussy neckline. It’s advisable to ditch statement necklaces if there is an elaborate adornment done on the gown. Instead, make sure that you wear a simple yet glitzy diamond pendant to spice up your look. Whether you wear a statement necklace or not, make sure to wear something on your ears, even if it’s as small as a pearl stud. However, if you are sporting a wavy, luscious hairstyle, your wedding ensemble will do without earrings anyway. Earrings also help in defining your neck and shoulder section. Case in point, if your neck or shoulder is short, a stylish pair of dangling earrings that fall slightly below the earlobe can virtually make it look elongated. Nevertheless, make sure not to wear long, circular earrings if your face is round as they can make it appear wider. If you don’t have pierced ears, consider clip-on pair for your wedding day. Whatever wedding ring you select, always remember, it would be the true representation of your eternal love. Therefore, choose your wedding dress according to your ring and not vice versa. Consult with your partner before jumping into shopping and all. Either you select gold (yellow or white), silver or diamond, check beforehand the feasibility of your wedding budget. Don’t forget, however, that the price of the metal is compared nothing to the symbol of your love. The cut and design you choose for your wedding ring should perfectly go with your personality. If choosing antique jewelries, you always have the option to use a family heirloom or you could seek pawn shops or estate sales for something that qualifies your taste instead. If your engagement ring is over-embellished with lots of intricate detailing, then ditch wedding bracelet as your ring would be enough to show off your glamor quotient. A perfect wedding ensemble swirls around the concept of looking sophisticated and elegant. And for such occasions, “the lesser the better” theory fits just fine. With already wearing a glitzy, delicate wedding ring on your finger, you need not to distract it with something more chunky and playful. However, if you can’t do without having any accessory defining your hand, be sure to keep your wrists understated with a simple pearl chain or thin diamond or silver bangle. Also, for the sudden pop of color to your wedding ensemble, a cuffed style gold bracelet could be a great option.